What a day. But now I'm under a roof. And have got me a bed. Otherwise, it started fine. Sun in the morning, but I did not let it fool me. Weather forecasters were not in doubt: heavy wind and rain from the south. I was prepared for the worst. But after packing a dry tent - hurray - I should say goodbye to the brotherhood. After all, cyclists have something to share in, even though we have different agendas. In this site one had arrived when I was about to pitch my tent and he fell over in the tent - his own - right on the spot. And before he appeared again, a French girl came. 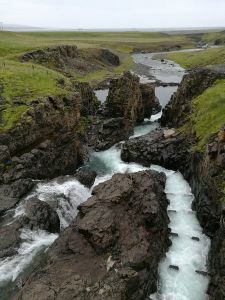 She had cycled the Kjölur route from the south. Would now go back to Reykjavik with a bus to get some cycling down south. Most people are limited in time, it's only me who is privileged. Later the guy in the tent appeared. He wanted to do the Ring Road, as the first Bulgarian ever. He had 15 days so he was busy. He lived in Poland now. Had cycled 17 hours in a row last night and only slept 2 hours, so he had been a little tired. We said our goodbyes and went out in every direction. I to the south, the Bulgarian to the north and the Frenchman by bus. The wind was as expected, and only 3 km passed before the full raincovering had to occur. Then it rained with only 2 stays for the rest of the day. When I had fought for the first 18 km, the road turned so that I "almost" got the wind in my back. And a toilet building appeared. Something to lean the bike on! There was a kitchen section, which was fully open, on the wind side, and two toilets on the other. There was not much to play about. Should I have lunch - and I should - this was the time. I fought on and rarely was the wind directly against. I had set my nose after a hostel, which should be after about 70 km. It was almost pure countdown all the way. After the first rain, the wind leaked for a while, but went on again. At about 4.15pm, finally, the famous hostel sign appeared. What a relief. I almost expected to fall off the bike when I arrived, but I held my legs. Also had chopped chocolate on a regular basis. Even better was that there WAS a free bed and that I could use my hiking card. I was wet both from the outside and from the inside, but got dried all on a scalding radiator while I was taking a shower. The bike stands out in some sort of garage with some of the luggage. Earlier they said in Iceland: There are the most sheep,then come horses, and finally people. 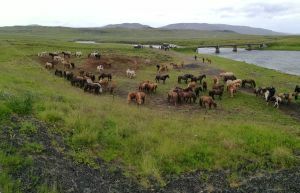 Today it is: There are the most tourists, so come sheep, so horses and finally Icelanders.